The autopilot_bridge ROS package bridges to autopilot protocols. For now it supports only MAVLink. NOTE: By default, the bridge waits to collect a time hack from the autopilot (SYSTEM_TIME message with non-zero fields). If running indoors or without GPS, you can specify --skip-time-hack to disable this behavior. In that case, the bridge uses the computer&apos;s time for all published messages. 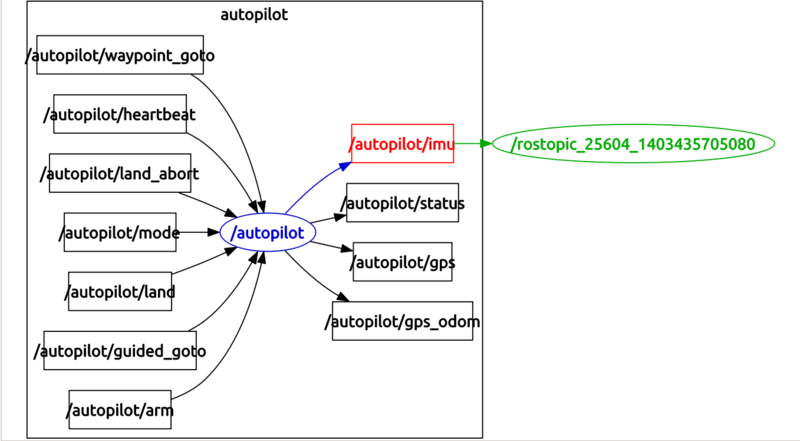 The ROS topic /autopilot/imu can be echoed but not plotted with rqt_plot.